Chet’s Dream will run from 8:300am until 4:00pm on Saturday and will offer skiers and riders access to one top-to-bottom run covered from tree-to-tree with an 18 inch base. The trails Catwalk, Mambo and Home Run make up this Opening Day run which is over a mile in length and nearly one thousand vertical feet. Loveland Ski Area also opened on October 20 last season. Loveland’s snowmakers will continue to make snow on Home Run and around the base of Chet’s Dream this week before moving on to opening additional terrain. Loveland Ski Area will be open 7 days a week until Closing Day in early May. Lift operation hours are 9:00am until 4:00pm on weekdays and 8:30am until 4:00pm on weekends and designated holidays. Early season lift tickets are $65 for adults and $31 for children 6-14. Members of the media are invited to Loveland Ski Area for Opening Day. Please reply to this email to coordinate a visit. Mother Nature delivered 3 inches of new snow to Loveland Ski Area last night and provided snowmakers with the cold temperatures they have been waiting for. Loveland Ski Area started making snow on Mambo and Home Run at 1:00am this morning. The temperatures dropped down into the low twenties and the snowguns were still firing out the flakes as of 10:00am this morning. Snow and cold temperatures remain in the forecast for the rest of the week and snowmaking could continue around the clock into the weekend. Loveland started making snow on September 25 last season. It typically takes about two weeks for Loveland’s snowmakers to cover the opening day run from tree-to-tree with an 18 inch base. Loveland Ski Area will open with a full top-to-bottom run made up of the trails Catwalk, Mambo and Home Run. This opening day run is 1,000 vertical feet and over a mile in length. Last year Loveland opened on October 20. Opening Day this season will be even more special as Loveland’s opening day run will be served by its first high-speed lift, Chet’s Dream. This new high-speed detachable quad from Leitner-Poma replaced Lift 1 and will be ready for Opening Day 2018. Snowmaking updates, images and video are available HERE. Loveland Ski Area is scheduled to start snowmaking in just 42 days and is excited to announce season pass, 4-Pak and 3-Class Pass pricing for the 2018/19 season. Loveland Ski Area Season Passes, 4-Paks, will be available for purchase online, over the phone and at ski shows across the Front Range starting on Friday, August 24. Just 53 miles from Denver, Loveland Ski Area is a favorite among locals for its easy access, affordable ticket and pass options, free snowcat skiing and abundant snowfall. Loveland Ski Area Season Pass holders enjoy one of the longest and snowiest seasons in the nation, receive discounts throughout the area including lift tickets for friends and family on each visit and are also rewarded with 96 bonus days at 32 partner mountains. Loveland Ski Area joined the Powder Alliance for the 2018/19 season and unrestricted Loveland Season Passes include skiing and riding privileges at the other 18 member mountains. Loveland went on to partner with an additional 14 mountains to provide pass holders with opportunities to explore even more mountains during the 2018/19 season. Midweek Season Passes come with 3 days at Monarch Mountain. Prices valid through December 2, 2018. Colorado’s least restrictive and most affordable ticket product, Loveland’s Unrestricted 4-Pak, will also be available on Friday, August 24 for just $169. With a Loveland 4-Pak, skiers and riders can access the mountain any day of the season for just $42.25/day. Loveland 4-Paks are unique in that they are 4 actual lift tickets that can be used by anyone on any day of the season with no restrictions and no blackouts. 4-Paks are only available through November 18, 2018. Snow sliders looking for an even better deal can save $10 on Loveland 4-Paks when they visit ski shows across the Front Range. Loveland 4-Paks will be available at every show Loveland attends for just $159, or $39.75/day. Loveland’s popular 3-Class Passes will also be available for pre-purchase at all sales events and offer huge savings for skiers and riders looking to combine three lesson packages with their season pass. All children 6-14 and first-timer adults that complete three full lesson packages are rewarded with a free season pass. Snow riders may also pre-purchase the three lesson packages and use the season pass all winter long. 3-Class Pass products are available for all ages and abilities with some restrictions. Loveland will be at Christy Sports’ Powder Daze in Littleton, CO August 24 through September 4 where parents can save 10% on all Children’s 3-Class Pass products. This deal is exclusive to Powder Daze Denver. Loveland will also be selling season passes, 3-Class Passes and discounted 4-Paks at Larson’s Ski & Sport in Wheat Ridge and at Evo in Denver August 31 – September 3. Skiers and riders can visit the Loveland booth at any of the shows above to purchase their season pass or 4-Pak and everyone is invited to play Loveland Lotto for their free chance to win a season pass, lift tickets, lesson packages, and more. Loveland’s event calendar has a complete listing of all fall sales events and additional specials exclusive to each show. Construction on Loveland’s new high-speed detachable quad, Chet’s Dream, is progressing as planned and the new lift will be ready for skiers and riders on Opening Day 2018. The construction of Loveland Ski Area’s new high-speed detachable quad from Leitner-Poma is well underway. While there is still a lot of work to do before it is ready for Opening Day, thanks to some help from Terry Henningson, a Loveland Season Pass holder and former Ski Patroller, the new lift has a name. The new lift will be called CHET’S DREAM in honor of Chester R. (Chet) Upham, Jr. (May 19, 1925 – January 24, 2008). Not everyone can dream big, but Chet Upham could. From the beginning Chet had a vision for Loveland that transcended what others had seen. Chet became a partner in Loveland Ski Tow Company in 1956 and immediately convinced the other partners it was time to install what would be Loveland’s first chairlift and only the third such lift in Colorado, Lift 1. While a major force in the formative years from 1956, it was when Chet bought out the other partners in 1972 that the true potential for Loveland was realized. From that day forward, the Upham Family has owned and operated Loveland Ski Area. Chet’s dedication and love for the ski area were legendary. He invested both time and money to build an affordable ski experience and wanted everyone who came to Loveland to feel as though they were guests of the owners. One of his favorite quotes was “if we’d get a dime, we’d spend it on improvements up there (Loveland),” the Upham Family said. That philosophy continues today and Chet’s Dream endures. A contest to name the new lift was opened to the public and Loveland received nearly three thousand entries. Loveland’s Board of Directors reviewed all the entries and selected Terry Henningson’s submission, Chet’s Dream. Loveland Ski Area will provide Terry with a chair from the old Lift 1 for providing the name of the new lift. With great pride and joy, the Upham Family and Loveland employees dedicate CHET’S DREAM in memory of Chet Upham. Loveland Ski Area is tentatively scheduled to start making snow in 59 days and open in mid/late October. April 5, 2018 – 2018/19 Season Pass Pricing, Free Skiing, Bonus Days and a New Lift! Loveland Ski Area’s 2018/19 unrestricted season pass products will be available on Monday, April 9 at the guaranteed lowest rates and provide snow riders with unlimited access to Loveland Ski Area next season, bonus days at over 30 partner mountains during the 2018/19, and free skiing and riding at Loveland for the remainder of this season. Loveland Ski Area is scheduled to close on Sunday, May 6. Loveland Ski Area bolstered its 2018/19 unrestricted season pass products with bonus days at 5 additional mountains to compliment their 12 partners from last year and will also join the Powder Alliance for the 2018/19 season. The Powder Alliance is a collaborative partnership of 19 winter resorts who share reciprocal season pass benefits. These additions provide Loveland season pass holders with bonus days at over 30 mountains across Colorado, the Western US, Canada, Chile and Japan for the 2018/19 season. Loveland’s midweek season passes are valid every Monday through Friday for the remainder of this season as well as all of next season with no holiday blackouts. They also come with three free days at Monarch Mountain for the 2018/19 season. Loveland’s 2018/19 season pass products will be available online, onsite and over the phone on Monday, April 9. Season Pass holders also enjoy discounts during every visit on lift tickets for family and friends, lessons, rentals, food, and Sport Shop purchases. Loveland Ski Area is just 53 miles west of Denver, offers free snowcat skiing along the Continental Divide and averages 422” of snow every season. Loveland’s season typically stretches from mid October through early May. Loveland Ski Area will open for the 2017/18 season on Friday, October 20. Lift 1 will run from 9:00am until 4:00pm on Friday and will offer skiers and riders access to one top-to-bottom run covered from tree-to-tree with an 18 inch base. The trails Catwalk, Mambo and Home Run make up this Opening Day run which is over a mile in length and nearly 1,000 vertical feet. Loveland Ski Area opened on November 10 last season. Loveland Ski Area will be open seven days a week until Closing Day in early May. Lift operating hours are 9:00am until 4:00pm on weekdays and 8:30 until 4:00pm on weekends and designated holidays. Early season lift tickets are $61 for adults and $29 for children 6-14. Members of the media are invited to Loveland Ski Area for Opening Day. Please call or email one of the media contacts below to coordinate a visit. Loveland Ski Area took advantage of an early drop in temperatures last night and started making snow for the 2017/18 ski season. Loveland’s snowmaking team started making snow on Catwalk and Mambo off Lift 1 shortly after midnight this morning. Temperatures dropped as low as 22 degrees and the snowguns were still piling up the snow at 9:00am. The manmade flakes were a nice compliment to the four inches of snow the ski area received on Saturday, September 23. Loveland started making snow on October 4 last year. It typically takes about two weeks for Loveland’s snowmakers to cover the opening day run from tree-to-tree with an 18 inch base. Last year Loveland Ski Area opened on November 7. Snowmaking updates, images and video are available HERE. If you would like to coordinate a visit or request additional photos please reply to this email or call the contact number listed above. We are only 43 days out from turning on the snow guns here at Loveland Ski Area. Loveland is excited to announce our pricing for the 2017/18 season! Loveland Ski Area Season Passes and 4-Paks will be available for purchase online, over the phone and at ski shows across the Front Range starting on Friday, August 25. Loveland Ski Area Season Pass holders enjoy one of the longest and snowiest seasons in the nation, receive discounts throughout the area including tickets for friends and family on each visit and are also rewarded with 30 free bonus days at partner resorts. Unrestricted 2017-18 Loveland Season Passes come with 3 free days at each: Monarch Mountain, Powder Mountain, Powderhorn, Purgatory, Snow King, Whitefish, Arizona Snowbowl, Pajarito, Hesperus and Sipapu. Unrestricted pass holders can also get 3 days at Crested Butte and Grand Targhee with the purchase of lodging. Midweek Season Passes come with 3 days at Monarch Mountain. Prices valid through December 1, 2017. Colorado’s least restrictive and most affordable ticket product, Loveland’s Unrestricted 4-Pak, will also be available on Friday, August 25 for just $159. With a Loveland 4-Pak, skiers and riders can access the mountain any day of the season for just $39.75/day. Loveland 4-Paks are unique in that they are 4 actual lift tickets that can be used by anyone on any day of the season with no restrictions and no blackouts. 4-Paks are only available through November 19, 2017. Snow sliders looking for an even better deal can save $10 on Loveland 4-Paks when they visit ski shows across the Front Range. Loveland 4-Paks will be available at every show Loveland attends for just $149, or $37.25/day. Loveland’s popular 3-Class Passes will also be available for pre-purchase at all sales events and offer huge savings for skiers and riders looking to combine three lesson packages with their season pass. All children 6-14 and first timer adults that complete three full lesson packages are rewarded with a free season pass. Snow riders may also pre-purchase the three lesson packages and use the season pass all winter long. 3-Class Pass products are available for all ages and abilities with some restrictions. Loveland will be at Christy Sports’ Powder Daze in Littleton, CO August 25 through September 5 where parents can save 10% on all Children’s 3-Class Pass products. This deal is exclusive to Powder Daze Denver. Loveland will also be attending Christy Sports’ Powder Daze in Dillon, CO and Larson’s Ski & Sport in Wheat Ridge, CO September 1 – 4. Loveland Ski Area will open for the 2016-2017 season on Thursday, November 10. Lift 1 will run from 9:00am until 4:00pm on Thursday and will offer skiers and riders access to one top-to-bottom run covered from tree-to-tree with an 18 inch base. The trails Catwalk, Mambo and Home Run make up this opening day run which is over a mile in length and nearly 1,000 vertical feet. Loveland Ski Area opened on October 29 last season. Loveland Ski Area will be open seven days a week until closing day in early May. Lift operating hours are 9:00am – 4:00pm on weekdays and 8:30am – 4:00pm on weekends and designated holidays. Early season lift tickets are $59 for adults and $27 for children 6-14. Members of the media are invited to Loveland Ski Area for opening day. Please call or email the media contact at the top of this release to coordinate a visit. Loveland Ski Area capitalized on the cold temperatures last night and started making snow for the 2016/17 ski season. Loveland’s snowmaking team started making snow on Catwalk and Mambo off Lift 1 at 10:00pm last night and the snowguns were still piling up little pieces of winter as of 1:00pm this afternoon. Not to be outdone, Mother Nature brought some friends to the party and covered the slopes with about an inch of natural snow. Flurries continue to fall at the ski area. Loveland started making snow on October 16 last year. It typically takes about two weeks for Loveland’s snowmakers to cover the opening day run from tree-to-tree with an 18 inch base. Last year Loveland Ski Area opened on October 29. Loveland Ski Area will be open through Sunday, May 8 and is extending the season for season pass holders everywhere. For the remainder of the season, Loveland Ski Area will offer discount lift tickets to anyone that presents a 2015-2016 season pass from another mountain. Anyone that shows a 2015-2016 season pass from another mountain will be able to purchase a full day adult lift ticket for just $38. That’s a $15 discount off the ticket window price. 2016-2017 season passes are also on sale now at the guaranteed lowest rates and offer snow riders unlimited skiing and riding all of next season, bonus days at Crested Butte, Monarch Mountain, Purgatory and Powderhorn, plus free skiing and riding for the remainder of this season. Loveland Ski Area’s 2016/17 unrestricted season pass products are on sale now at the guaranteed lowest rates and provide snow riders with unlimited access to Loveland Ski Area next season, bonus days at Crested Butte, Purgatory, Monarch Mountain and Powderhorn during the 2016/17 season, and free skiing and riding for the remainder of this season. Loveland Ski Area is scheduled to close on Sunday, May 8. Loveland’s 2016/17 season pass products are now available online, onsite, and over the phone and include discounts during every visit on lift tickets for family and friends, lessons, rentals, food and Sport Shop purchases. Loveland Ski Area is just 53 miles from Denver, offers free snowcat skiing along the Continental Divide, and averages over 400 inches of snow each season. Loveland’s season typically stretches from mid October through early May. Loveland Ski Area will open for the 2015-2016 season on Thursday, October 29. Lift 1 will run from 9:00am until 4:00pm on Thursday and will provide skiers and riders with access to one top-to-bottom run covered from tree-to-tree with an 18 inch base. The trails Catwalk, Mambo and Home Run make up this Opening Day run which is over a mile long and nearly 1,000 vertical feet. Loveland Ski Area opened on November 1 last season. Loveland Ski Area will be open seven days a week until Closing Day in early May. Lift operating hours are 9:00am until 4:00pm on weekdays and 8:30am until 4:00pm on weekends and designated holidays. Early season lift tickets are $53 for adults and $25 for children ages 6-14. 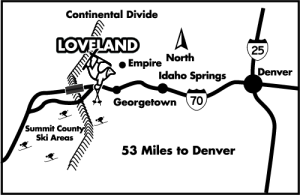 Members of the media are invited to Loveland Ski Area on Opening Day. Please call or email the media contact at the top of this release to coordinate a visit. After waiting out some unseasonably warm temperatures, Loveland’s snowmaking crew was finally able to start making snow for the 2015/16 season. The snow guns at the top of Lift 1 laid down the first flakes around 11:00pm last night and remained on through 7:15am this morning. It typically takes about two weeks for Loveland’s snow makers to cover the 1,000 foot vertical run from tree-to-tree with an 18 inch base for Opening Day. Last season Loveland opened on November 1. Snowmaking updates and images are available at skiloveland.com/snowmaking-operations. If you would like access to the ski area or additional photos, please reply to this email or call (303) 571-5580 X172. Loveland Ski Area Season Passes and 4-Paks will be available for purchase online, over the phone and at ski shows across the Front Range starting on Friday, August 28. Loveland Ski Area Season Pass holders enjoy one of the longest and snowiest seasons in the nation, receive discounts throughout the area including tickets for friends and family on each visit and are also rewarded with 12 bonus days at partner resorts. Unrestricted 2015-16 Loveland Season Passes come with 3 days at Monarch Mountain, 3 days at Crested Butte, 3 days at Purgatory and 3 days at Powderhorn. Midweek Season Passes come with 3 days at Monarch Mountain. Prices valid through November 22, 2015. Colorado’s least restrictive and most affordable ticket product, Loveland’s 4-Pak, will also be available on Friday, August 28 for just $139. With a Loveland 4-Pak, skiers and riders can access the mountain any day of the season for just $34.75/day. Loveland 4-Paks are unique in that they are 4 actual lift tickets that can be used by anyone on any day of the season with no restrictions and no blackouts. 4-paks are only available through November 22, 2015. Snow sliders looking for an even better deal can save $10 on Loveland 4-Paks when they visit ski shows across the Front Range. Loveland 4-Paks will be available at every show Loveland attends for just $129, or $32.25/day. Loveland will be onsite at Christy Sports’ Powder Daze event in Littleton, CO August 28 through August 30 and again September 4 through September 8 where parents can save 10% on all Children’s 3-Class Pass products. This deal is exclusive to Powder Daze Denver. Loveland will also be attending Sports Authority’s SNIAGRAB at The Denver Sports Castle September 4 – 7 where parents can save $79 on a Child Season Pass when they purchase a season long rental for their young skier or rider. This deal is valid at most Front Range Sports Authority locations. New this season, Loveland will be at Larson’s Ski & Sport in Wheat Ridge September 4 – 7. Skiers and riders can visit the Loveland booth at any of the shows above to purchase their season pass or 4-Pak and everyone is invited to play Loveland Lotto for their free chance to win a season pass, lift tickets, lesson packages, $10 Beau Jo’s gift cards and more. Loveland’s event calendar has a complete listing of all fall sales events and additional specials exclusive to each show. Loveland’s popular 3-Class Passes will also be available for pre-purchase at all sales events and offer huge savings for skiers and riders looking to combine three lesson packages with their season pass. All children 6-14 and first timer adults that complete three full lesson packages are rewarded with a free season pass! Snow riders may also pre-purchase the three lesson packages and use the season pass all winter long. 3-Class Pass products are available for all ages and abilities with some restrictions. Loveland Ski Area is tentatively scheduled to start making snow in 37 days.